Has anybody found out the hashrate for rx 470 memory overclocked?I can find only stock ( atleast that is what i think so ) and it was around 24 same as rx 480.Will overclocked rx 470 8gb perform the same as rx 480 in etherium ? cryptomining-blog.com/8186-expected-ethereum-hashrate-of-the-new-amd-radeon-rx-470-gpus/ 24.5-24.6 MHS with the 8 GB version stock. OC should hopefully bring it a bit higher, we'll see tomorrow! 24 is unlikely at stock, 1750 on the 4GB 480 doesn't give you that and this has stock 1650. Wont be anywhere near as close to 24 for 4GB version. Mem is rated at 1650 on these so max will be around 23. The 8GB version will cost as much as the 480...so might as well buy 480s. If 470 will hash at 20-21 as the link suggests, why even bother with 470? Thinking of getting R9 380 instead (or 480, indeed). There will however be AMD Radeon RX 470 GPUs with 4GB of video memory where the operating frequency could vary between 6.6 GHz and 7 GHz and these should have lower performance for Ethereum. The expected hashrate in mining Ethereum is more like around 20 MHS for the 6.6 GHz video memory and about 21 MHS for the 7 GHz models. hopefully, it would be as you said, I am just quoting from the source. In fact, I was thinking of getting 470, but won't if it is $200. Yes, I was contending that this was what the link said. Please don't bring any agendas that you may have into this friendly banter. What exactly is your point, pal? @cscheat that's awesome - what model 470 and at what settings pls? @cscheat How many MH stock? What miner? it is difficult for you to see how others may perceive you, isn't it? I was not talking to you when I posted my initial message, so you don't have to "fix" anything, really. Some guy posted on Bitcointalk forum. So unless you can unlock/flash the bios to up the memoryclock, the 8GB is the only one worth it but pricewise its not a good deal. Quite disappointing to hear that for the 4GB versions. The only 4GB 470 Newegg has in stock is the PowerColor and they have it priced at $179.99 + $5 shipping. That's a no go IMO. Yeah, it's beyond ridiculous. None of these cards are going to sell at these prices. I guess they'll just have to sit there for weeks until the vendors figure it out. Damn. Was hoping to pick up a 470, but with those prices, likely not. Maybe the retailers thought they could squeeze out some more profit because of how fast the 480's sold. How is performing RX 470 in others algo ? like SIA, Lyra2rev2 etc ... ? so can someone confirm this, the 4gb one only gets like 21mhs and the 8gb one gets 25mhs.... but the 4gb one can't be overclocked to 8gb mhs speed?? Do you know if this site ships to EU or just FRA? It looks like they only do to FRA and its territories + Belgium. 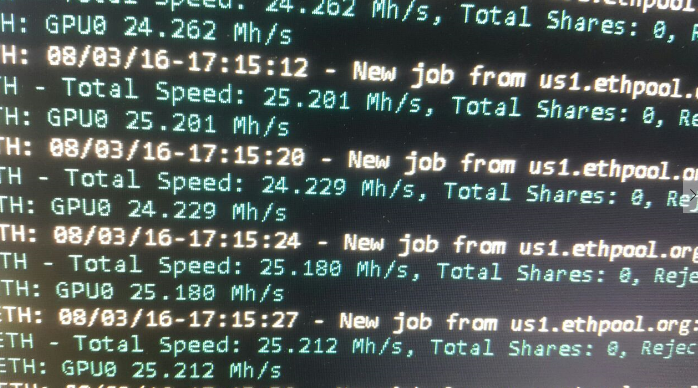 anybody can share their hashrate for 4GB version of RX 470 ?